What is the Client Support Log? The Client Support Log is a feature designed to confirm receipt of the NDIS support items as delivered in the direct services provided to Clients via Activities. This information is also available to watch in the What is the Client Support Log? video. Why is the Client Support Log important? Wherever possible, these logs should be signed by the participant, a parent/guardian, nominee or carer, as confirmation, the support was delivered as claimed - Retaining documentation of support delivery. Whilst Support Log evidence is not required for all support types, many providers choose to complete this level of documentation to ensure the highest level of governance is maintained. When is the Client Support Log available? When this feature has been activated for the Service the Activity is being facilitated by, and Support Log Evidence is set to being required, the Client Support Log feature will be available for completion. after the Activity Sign Off has been performed. Support Logs can only be completed for Clients who are paying for the Activity using NDIS Funding and have NDIS support items allocated to be invoiced and/or claiming. When a Support Log exists, the NDIS Support Items allocated for that Client cannot be amended. This is important to ensure the completed support log matches the allocated supports. If any amendments to these allocations are required, the existing Client Support Log must be removed. When is the Client Support Log not available? For clients who are not paying for the Activity using NDIS Funding e.g. Billable. When no NDIS Support Items have been allocated. If the 'No Charge' setting has been applied for a Client. How is the Client Support Log completed? the Staff member can record Evidence has been Received. Please note providers are responsible for deciding which of these methods is suitable and to be used. 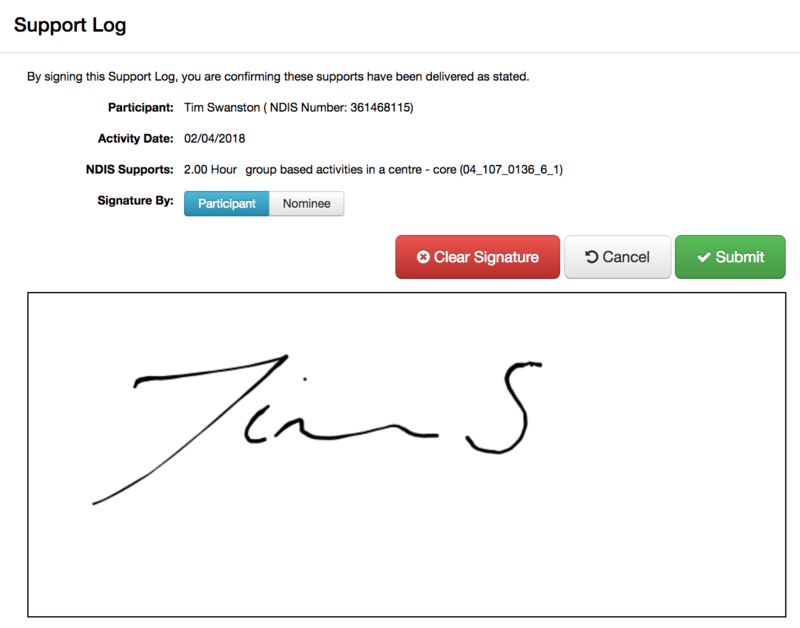 Completing a Support Log via 'Digital Signature' allows for the Client or their Nominee, to perform an electronic signature from a tablet device or using a computer with a touchscreen monitor, or regular monitor and mouse. Temporary control of the chosen device must be given to the Client or their Nominee, in order to complete a Support Log via Digital Signature. Therefore, it is imperative that SupportAbility restricts the level of access granted during this process. When using the Digital Signature feature, SupportAbility enters a locked ‘client mode’. This ensures Clients and Nominees can complete a Support og, yet be restricted from accessing all other data and functions within SupportAbility. Your organisation’s 'Client Mode PIN' must be entered to exit out of client mode and return to the Activity. Digital Signatures are stored securely in SupportAbility and are only viewable by staff with the privileges required to do so. Completing a Support Log via Evidence Received is an alternative to completing the Support Log via Digital Signature. Or, when another form of acceptable evidence has been received and uploaded as a document to the Client's record in SupportAbility. It is however, up to each providers compliance team, to determine what constitutes acceptable forms of Evidence and ensuring compliance and governance requirements are upheld.